Now available ,the new 6.8kWh, ESS 7.0 lithium Energy Storage System offers high performance in a modern, aesthetically pleasing design intended for residential and small commercial use. The 48V, high efficiency unit offers a seven-year warranty at 5,000 cycles, with a potential life span of up to 20 years. GeoComfort Element Series geothermal systems are expertly designed to be technologically advanced, exceptionally efficient and smaller than the alternatives. The Element Series compact vertical packaged model is the perfect unit for installations where space comes at a premium. What if going green was free? 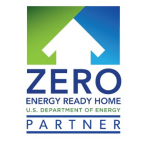 Our Homes Consume up to 90% less energy. What if going green was free? Net Zero Contractors and our sustainable partners have teamed up to bring you a line of beautiful, affordable and sustainable homes. Featuring cutting-edge design and energy- efficient construction, Our homes are capable of producing as much energy as it will consume in one year period, achieving Net Zero Energy status. Our homes are versatile in design that pairs aesthetic simplicity with sophisticated technology.